Spinning Maiden to one side and the Boy on a Buffalo to the other. The lid bears two small prints depicting elements of the Spinning Maiden pattern and one of these is also used below the spout and the other below the handle. The spout and handle are decorated with floral spray prints. The trellis borders on the pot and cover are painted. The reverse side showing the Boy on a Buffalo print. 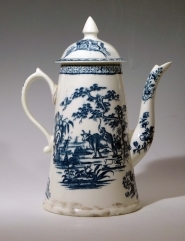 This coffee pot is of a tapering cylindrical form that is characteristic of Derby. The base bears three "patch marks" also characteristic of the factory. The pot is printed with the Spinning Maiden to one side and the Boy on a Buffalo to the other. The lid bears two small prints depicting elements of the Spinning Maiden pattern and one of these is also used below the spout and the other below the handle. The spout and handle are decorated with floral spray prints. The trellis borders on the pot and cover are painted.